that seemed to reach the point of ecstasy. loved to lick the honey jar. whose silent five-word prayer was Give the dog a bone. deren Fünfwortgebet hieß: Gebt dem Hund einen Knochen. in ein Brodsky-Sonett an Maria Stuart versenkte. Gerard Smyth was born in 1951 in Dublin, Ireland. He grew up in Dublin's Old Quarter The Liberties, which has significantly influenced his poetry. In the late 1960s he began to publish texts. 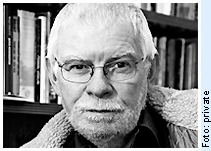 Until now, he has published seven volumes of poetry: “World Without End” (New Writers’ Press, 1977), “Loss and Gain” (Raven Arts Press, 1981), “Painting the Pink Roses Black” (1986), “Daytime Sleeper” (2002), “A New Tenancy” (2004) and “The Mirror Tent” (2007, all Dedalus Press). His most recent book 'The Fullness of Time. New and Selected Poems ' was published in April 2010. In May 2009 he was elected a member of Aosdána, the Irish Academy of Arts. In 2012 he won the Lawrence O'Shaughnessy Award for Poetry.